I come from a long line of pie bakers in my family. I remember my Great Grandma, Martha Cook, making her wonderful Boysenberry Cobblers that I still dream about. My Grandma Billie made a perfect Pecan Pie. Pronounced, puh-can, that’s the way it will always be for me. But my Mom can make a pie crust like nobody’s business, flaky, tender, perfect crust. I think the trick is not over working your crust, just do it and don’t think about it. She also makes the best Pumpkin Pie that I have ever had. My son requested Pumpkin Pies instead of a cake for his birthday. Yes his love for pie is in his blood. My Mom made two pies because she knew that her grandson could eat a whole pie by himself without blinking an eye. Topped with fresh whipped cream, nothing more comforting. I have been eating this pie my whole life and can’t imagine a holiday without it. Combine filling ingredients in order given, divide evenly into pie shells. Bake 15 mins, reduce temperature to 350 degrees F and bake an additional 45 mins, or until knife inserted in center comes out clean. Wrap foil around crust if browns too quickly. Cool, garnish with whipped cream. It’s wonderful to have a special MoM! How very sweet of her to make two pies! I love this story. :). You put a smile on my face! I am going to make your MoM’s pie next week. So looking forward to it. By the way it’s my sons favorite pie! I know he is going to be so happy. Thanks for the recipe. 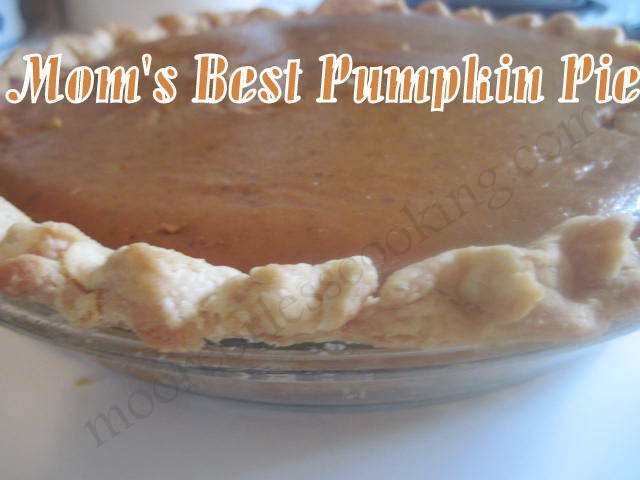 You are so welcome, I know your son will love this pie because you have a special added ingredient~ LOVE!! anxious to try this pumpkin pie recipe! !